Along with video comes the need for audio. Whether it is the native audio from the scene, sounds and music you are mixing in, or a combination of both, audio is an important part of a compelling video experience. That means you need to start paying as much attention to your ability to accurately edit audio as you do video and photos. For visual content we rely on color managed workflows, and most of us are well aware of the limitations of our own vision and how to work around them. But for most photographers audio is new terrain. Most of us do not have perfect hearing – age-related high-frequency hearing loss being among the most common ailments. So simply firing up your computer and creating an audio mix by ear may not be getting you the results you think, any more than color correcting on a non-calibrated display would. To get a baseline of both my hearing and what is possible in compensating for hearing loss, I had an audiologist do a full-on hearing test, and work with me to program a pair of high-end Phonak hearing aids (retailing for over $6K for the pair). The test confirmed some high-frequency hearing loss. The hearing aids did indeed bring to life high frequencies in music and sounds. They were also nearly invisible. Score one for modern medicine. The downside, besides the effort involved in seeing an audiologist, is the cost. An easier, and cheaper, version is a Costco Hearing Center and $1,600 pair of their hose-branded hearing aids. I haven’t auditioned them, but they are somewhat-de-featured versions of models from Phonak and other major suppliers. The other problem with using hearing aids to mix your audio is that you aren’t isolated from your environment. As my audiologist explained, that is very deliberate. Assuming you still have most of your natural hearing, you want to let that through and only amplify the missing portions, to get the most natural overall sound. As a result you are limited to places where you have decent speakers and an otherwise quiet studio. So I’ve also been working with a couple over-the-counter options that are less expensive and can provide sound isolation. Nuheara was a pioneer in providing customizable listening solutions based on a self-administered hearing test. I’ve been using a pair of their flagship IQBuds Boost off and on for almost a year. They are Bluetooth earbuds with a difference. You start by testing your hearing using their mobile app. That provides the buds with a default correction, but you can further customize your experience based on the situation. You can have them mask off the outside world or let it in. If you choose to let it in, you can tell them to focus on what is in front of you, and control the mix of outside and streamed sounds. Since I was already familiar with them as part of my roundup of over-the-counter hearing aids, I thought I’d try them for mixing audio as well. For audio mixing you’ll mostly be interested in what you’re streaming, and masking everything else out. In practice, I found the audio quality good for earbuds, but not as rich as a good pair of over-the-ear headphones. Being earbuds, they are small and convenient to travel with, and can be used anywhere. The company has also announced a new version, called Max, that adds active noise cancellation. Selling for $500 on Amazon, they definitely aren’t for everyone, but as flexible hearing assist options go, they have a lot to offer. However, the buds need to be paired with Nuheara’s mobile app on Android or iOS. So you can use them for mobile video editing, but they won’t help if you’re using a Mac or PC. For that, I looked around and found Audeara. Audeara is a relative newcomer to the market. Founded by Australian physicians in 2014 as a Kickstarter project, their over-the-ear headphones start with an excellent hearing test (it was in fact quite similar to the main elements of the one I got from an audiologist – with very similar results -- plus it continued through much higher frequencies than the medical version). Once your hearing profile is created, it is loaded into the headphones so it is available no matter what device you use them with. That is a little different from the IQBuds, where the app on the paired device is used to actively control them. You can use the A-01s either wired or via Bluetooth (where they get an impressive 35+ hour battery life). A second switch on the unit optionally activates active noise cancellation. As to their overall ranking in the pantheon of out-of-the-box great music-listening headphones, I’m not qualified to judge since my hearing is hardly perfect. But for that very reason, they provide better sound for me than even the best traditional models, as my custom profile amplifies the high-frequency content in music so that I can hear it more accurately. From a practical perspective, I like that I can use the A-01s to get a consistent experience no matter where I’m doing my editing (or music listening). I can plug them in to my main editing workstation, or take them on the road paired with a laptop. For in-the-field editing, I can even use them paired with a phone or tablet. The only downside is size. 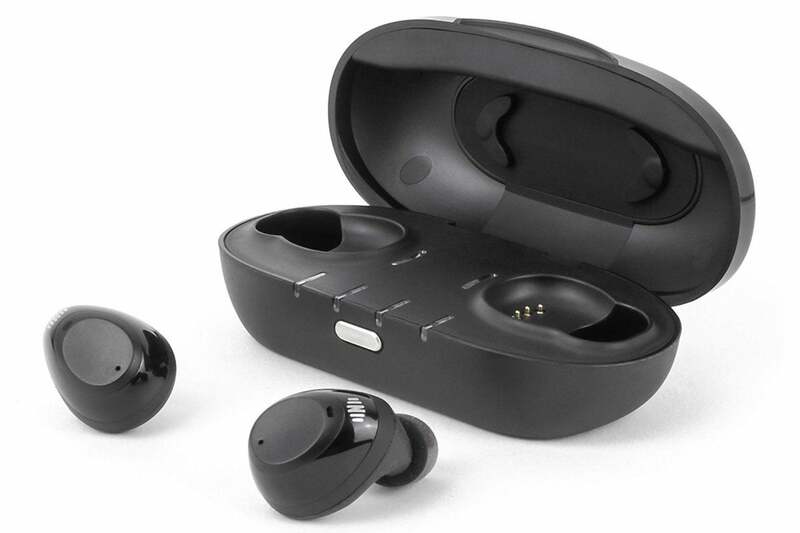 They are certainly less convenient than having a pair of wireless earbuds, but you get 10x the battery life, better sound isolation, and active noise cancellation in exchange. At their initial price of $400, the Audeara headphones were a definite stretch, but now that they are available on Amazon for $249, they are worth considering if you want a way to correct for your hearing loss when editing. They will also improve your listening experience for music and movies. I’ve used them for that over Bluetooth with my phone, plugged into our sound system, and plugged into our Roku remote with good success. My experience with them hasn’t been perfect, as there is sometimes a crackling sound generated at or near the frequencies where my hearing loss is most dramatic, and it is presumably doing the most it can to correct it. The noise cancelling also caused a small hum in a quiet room, which the company says is not typical, and probably an issue with my review unit. That said, you don’t really need noise cancelling in a quiet room, anyway. In a noisy environment I didn’t notice a hum. I’ve also only been able to get them to pair with a single device at a time. That seems like an unfortunate limitation for a premium product. That said, while some reviews have complained about very-slow firmware updates and difficulty pairing, I haven’t experienced either of those problems (I have paired them with Chromebooks, a laptop, and several different model Android phones). If you don’t have any substantial hearing loss, then for the same price you can get a pair of Bose QuietComfort headphones for a similar price, depending on the model. The simplest way to get started is to take one of the free online hearing tests. A very simple one that seemed to work well for me is hearingtest.online. It will give you either a quick overview or a more detailed analysis. You’ll need to take it in a quiet room and/or with isolating headphones to get an accurate result, though. From there you can decide how serious the issue is for you, and whether you want to look into augmenting your hearing using some type of hardware assist.